Until last year I was not really a fan of the Porsche 911, which I guess in part comes from living in central London and seeing lots of them on the road every day. With most of these cars having been purchased as status symbols rather than for their performance and handling. 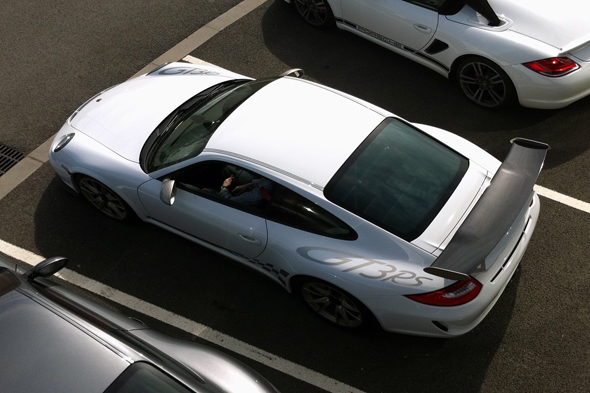 However, after driving a 911 (997.2) Turbo back to back with 5 other supercars on the public roads last year, it became very apparent why the Porsche 911 is held in such high esteem as a driver’s car. The 911 Turbo was extremely quick and with its four wheel drive system had great traction, even in the wet when I drove it. However, I was keen to try the lighter and more track focused 911 GT3 RS at the Porsche Experience Centre which is located within the Silverstone circuit in Northampton. Externally the GT3 RS is easy to distinguish from the lesser models in the 911 line up. It sits closer to the ground on lowered suspension, has an imposing front splitter, uses the wider Carrera 4 body shell, with extended front wheel arches, a huge carbon fibre rear wing, bucket seats and half a roll cage where the rear seats would normally be located. 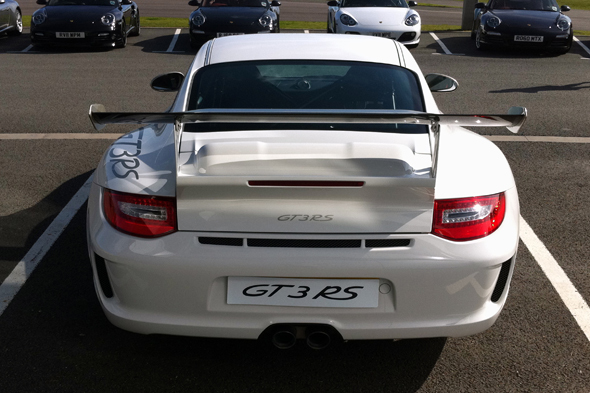 The GT3 RS was fitted with a 3.8 litre flat six engine which develops 444 bhp. This might be the most lightweight track focused 911, but it still weighs a not insubstantial 1370kg. 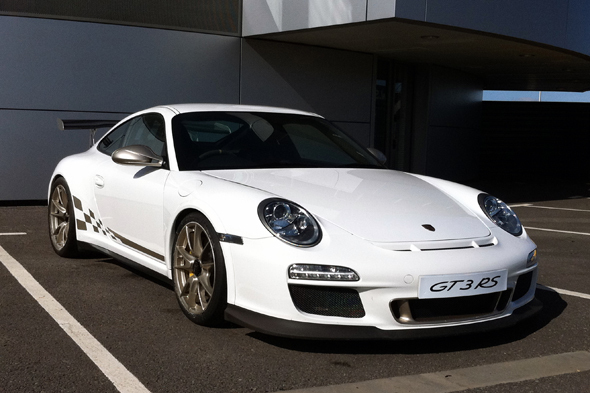 The GT3 RS was available in white, grey or blue with a choice of contrasting red or gold wheels and stickers, which means the GT3 RS stands out, even in a car park full of high performance cars. Sitting in the GT3 RS for the first time it is immediately obvious how low the car is to the ground, and how low the bucket seats are mounted. At 5′ 10″ I could only just see over the alcantara wrapped steering wheel. The thinly padded carbon fibre seats have a fixed back and only adjust forward/backward with a manual lever, but were surprisingly comfortable and held you securely without being overly tight or restrictive. Pulling away for the first time I depressed the heavy clutch pedal, slotted the short alcantara covered gearstick into first and gently increased the revs. The heavy clutch certainly requires a strong left leg when changing gear, but it was actually relatively easy to set off without stalling or using excessive revs, and to make a smooth gear change once the car is rolling. The brake pedal is almost solid meaning that it’s the force that’s applied to the pedal and not the distance you press the pedal which determines how strongly the brakes pads are forced against the ceramic discs. The Porsche Experience Centre at the Silverstone circuit includes four areas (Handling Circuit, Kick Plate, Ice Hill and Low Friction) where you can explore the performance and handling of the car. I began with the Handling Circuit, which resembles a challenging country road with a variety of cambers, blind corners and elevation changes to test the car and driver. My driving consultant Neil asked me to drive 4 or 5 laps so that he could assess my driving technique and lines around the circuit. 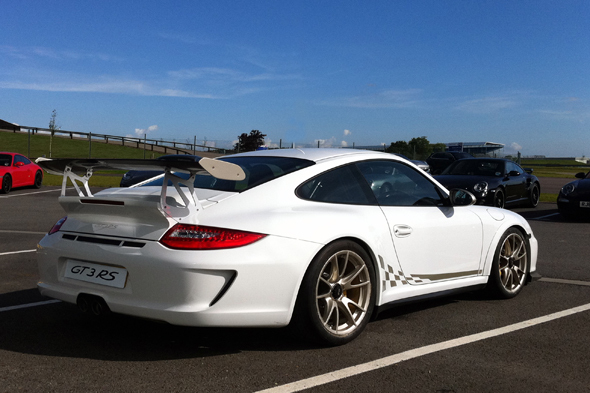 It didn’t take more than a lap to appreciate why the GT3 RS won EVO magazines Car of the Year (CotY) in 2010. The whole car feels so tightly screwed together and there’s not a millimetre of imprecision in any of the controls. I guess that’s German engineering for you. The steering is razor sharp with the sticky Michelin Pilot Sport Cup tyres generating huge levels of grip and enabling you to position the car accurately on the road, but also giving plenty of feedback as the road surface or camber changed. With the suspension on the softer of the two PASM settings the ride quality was very good, and you could certainly use the car every day. Having completed 5 laps Neil asked me to return to the holding area so that he could give me some feedback on my driving. Neil said that my lines were good but that I was braking too hard and over too short a distance. He advised that I needed to brake over a longer distance and be smoother coming onto and off the brakes in order to manage the weight transition. After another 5 laps of the Handling Circuit I was beginning to improve my braking and the both my driving and the car became much smoother and more progressive. The tight and twisty nature of the Handling Circuit didn’t provide a great opportunity to experience the high speed performance of the GT3 RS, but accelerating hard out of the corners it was apparent that the 3.8 litre engine was not lacking in power or noise. Neil and I then moved onto the Kick Plate, which effectively simulates a large area of sheet ice with a “Kick Plate” that puts the car into a slide as you drive over it and onto the surface. On my first attempt at about 15 MPH I managed to catch the slide, but as we increased the speed to around 25 MPH I had a few dramatic spins as I struggled to control the car. However, on my final attempt I managed to catch the spin, not an easy skill to master and shows that even a small increase in speed can significantly reduce the changes of a driver correcting a spin in poor weather. Next it was the Ice Hill, a 7% gradient decent with a slippery surface covered by a constant flow of running water just for good measure. The challenge was to get to the bottom of the hill, steering around the jets of waters shooting up vertically from the road surface without skidding. On my first attempt with the traction control switched on, I simply steered around the two obstacles without any drama. Given how good the traction control and stability controls are on modern Porsches you either need to be a incompetent driver or driving at excessive speeds to get into trouble on the public roads. On the second run with the traction control switched off I got half way down the slope before I spun negotiating the second obstacle. Neil explained that the correct technique was to make very small steering inputs before returning the steering to the straight ahead position. This felt very strange, but was very effective and I easily made it to the bottom of the hill on my next attempt without spinning. The final area I explored was the Low Friction track, where the objective was to provoke the car into a controlled power slide. A series of corners had been specially polished to reduce the level of grip making it easier to slide the car. However, in a car with as much rear end traction as the GT3 RS it required a hard application of the throttle in first gear to unstick the rear tyres, even with the traction control switched off. For me this was probably the most challenging of the four areas, and trying to provoke the GT3 RS into a controlled power slide was a difficult technique to master. However, after a couple of unsuccessful attempts I managed a couple of respectable power slides, but a lot more practice is required to perfect my drifting skills. Overall my 90 minutes in the GT3 RS at the Porsche Experience Centre had been great fun and had given me the opportunity to drive the car in a number of extreme situations that a regular dealer test drive could never hope to match. It’s an expensive activity, but one which I would highly recommend to anyone thinking of purchasing a Porsche as it provides a great insight to the performance, handling and capabilities of the vehicle. And so to the Porsche 911 GT3 RS itself. The term “Racecar for the Road” is used all too frequently, but I cannot think of any car which deserves this badge more that the GT3 RS. It is a serious driver’s car that needs to be driven well to get the most out of it, but rewards hugely when you do. For me it is the polar opposite of the Nissan GTR that I drove a couple of months ago. The GT3 RS makes you work hard on your driving technique and every mistake is immediately amplified. Whereas the GTR feels like it is doing all the work for you, with its computers cover up any driving errors. I think I have found my next car when the time comes to upgrade from my VW Golf R32 Mk4. So the saving starts here, both for the car and the Porsche driving course as I improve my technique to make the most of the car’s performance on the road and on the track. But which colour combination to go for?